Compared to loud, ‘in your face’ confidence, quiet confidence is more attractive, satisfying and sustainable. How we think and how we behave are linked so you can improve your confidence by working on one and then the other or on both simultaneously. If a book is to make a real difference, it has to do more than inspire you; it has to give you practical, ‘how to be confident’ solutions you can implement easily. It helps you think about confidence and the difference improving your self-confidence will make to you. It helps you think about how much confidence you want in specific situations. It helps you identify what is affecting how you think and behave enabling you to make your natural brain processes work for you instead of against you. It explains a range of proven, practical and mutually reinforcing ideas that will enable you to build your confidence easily, step by step. It shows you how to help other people be more confident. It shows you how to benefit from the cumulative effect of making confidence a habit so that confidence comes naturally to you for the rest of your life. 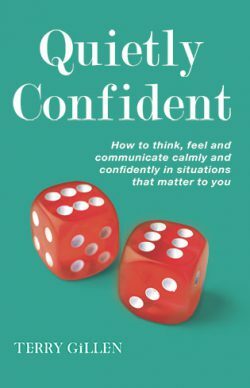 To download a sample chapter of Quietly Confident click here.